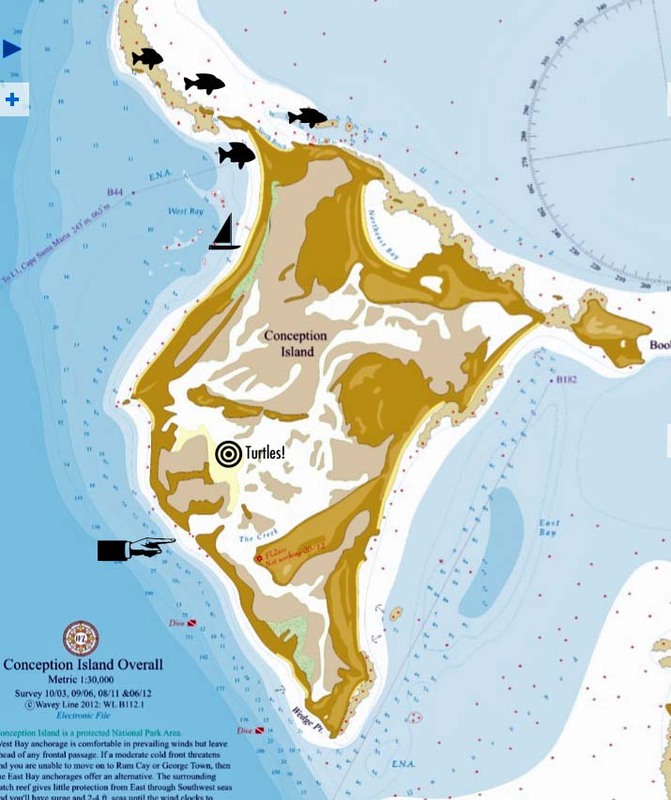 Conception is a little island kinda’ off the beaten path. It’s out there with NO protection, so you gotta’ wait for a nice weather window to go because there is no where to comfortably hide if a cold front comes through with west winds. 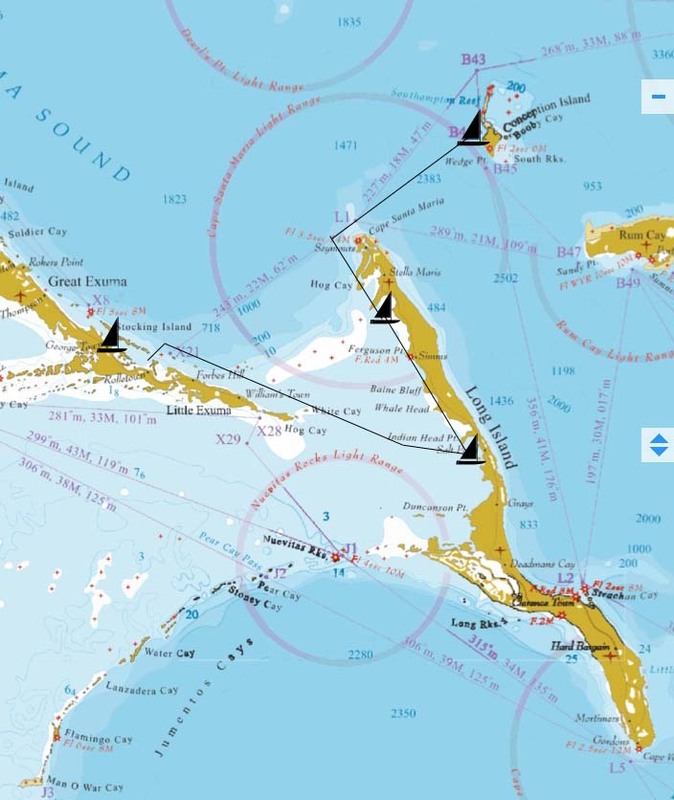 Here’s our route from George Town to Long Island to Conception. Notice how out of the way little Conception is!? Kim and Scott had met some folks, who knew some folks, who were maybe going to be there doing some turtle tagging, so we thought it would be cool to try and be part of that action. Unfortunately, the turtle taggers were delayed due to engine troubles and there wasn’t any tagging during our stay. We did dinghy into “the creek” to see the turtles and we jumped in and swam with them too! This is Conception Island. The sailboat is where we anchored, the fish show where we snorkeled, the pointer shows the itty-bitty cut we took the dink through to see the turtles, and the bullseye is where the turtles were. Turtle power! Conception is uninhabited and beautiful. It is a quiet anchorage filled with nature loving cruisers, trails to hike, and lots of coral to see. It is a National Park, so fishing isn’t allowed (although we did see some jack holes on a big old fishing boat, named Butter and Eggs, who didn’t care about protecting this beautiful island and were fishing anyway! Grrrr!). We were also lucky enough to be there during a full moon, so we hiked up to the top of this nice cliff and watched the moon rise right up over the ocean. It was a really beautiful night. Anyway, Conception is all about the outdoors and sea life, so a picture post is in order! Click the first pic for a slideshow and more ramblings :) Enjoy! I swear it did not FEEL as bad as this LOOKS! And here’s one of Anthyllide! Our dink and the anchorage. So often, you feel so small out here! This is the MOON rise. Isn’t it stunning!? My hot hubby in his “new to him” wet suit. Kim and Scott leading the way through the coral heads! The water here was so clear! A turtle! Can you see him? Although Conception had some of the clearest water, the turtle spot was pretty murky! Playing with that wide angle again. Not sure what this is about. Can you Google it for us? Getting ready to head back to G-Town.